Sugar Bowl ski resort in Lake Tahoe has surpassed the 600-inch mark in a season that has 17 days left until its final day of skiing and snowboarding Lake Tahoe. The snow keeps coming at Tahoe Ski Resorts, where it snows several times over the past week and another storm is expected to arrive Thursday evening (April 4). Conveniently located off Interstate 80 at the Norden exit, Sugar Bowl has received 13 inches in the past week, including 5 inches Tuesday. That has propelled the popular Tahoe ski resort over the 600-inch mark – 611 inches for the season. Sugar Bowl announced earlier this season it has extended its season until Sunday, April 21. Squaw Valley has the most snow among Tahoe ski resorts with 670 inches. Sugar Bowl is one of many Tahoe ski resorts that offer discount lift tickets for the remainder of the 2018-19 season. There’s still plenty of time to take advantage of the deals at Sugar Bowl for the 2018-19 ski season. The best deal for lift tickets is to shop online at least two days in advance. Skiers and snowboarders Lake Tahoe can save as much as 50-percent off a lift ticket, depending on how far out they purchase and for what date. Wednesday’s Military & First Responders are able to extend this benefit to others with a 2-for-1 full-price adult lift ticket. Skiers or riders need to present a valid ID at any ticket window. Find details on deals at Sugar Bowl, click here. Season pass: In addition to season passes at Sugar Bowl, season pass options for Royal Gorge Cross Country will also be available March 18 starting at $199. Click here for more details. Homewood Mountain: For the third time in this decade, Homewood has reached the 600-inch snowfall mark this season. 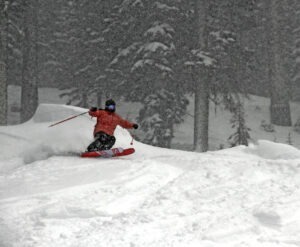 Thanks to the most recent storm, the resort crested 602 inches and there is more to come. The National Weather Service forecast is calling for more snow this weekend. Skiers and riders interested in taking advantage of the late season snow will have until April 21 due to Homewood’s season extension. Homewood is among the Tahoe ski resorts that has received 600 inches or more in a fantastic season for snow totals. Homewood has a series of spring events planned, animating the on-mountain experience for resort guests through closing weekend. Passholder Ski/Ride Earth Day Celebration: On Monday, April 22 after the resort has officially closed for the season, Homewood will open for limited hours of operation for season passholders only from 10 a.m. to 2 p.m.
As part of the Earth Day celebration, all food and drink proceeds will benefit the nonprofit Tahoe Fund, an organization committed to environmental projects around the Lake Tahoe Basin that emphasize recreation, conservation and education. The best bet on a storm day, Homewood’s wind-protected slopes give skiers and riders access to the deepest and stormiest days of the season. Starting at just $469, 2019-20 season passes are now on sale. With no restrictions or blackout dates, those who purchase their 2019-20 season pass now are invited to ski or ride the rest of this season and all of next. Learn more at www.skihomewood.com. Should skiers hang on to aging equipment?